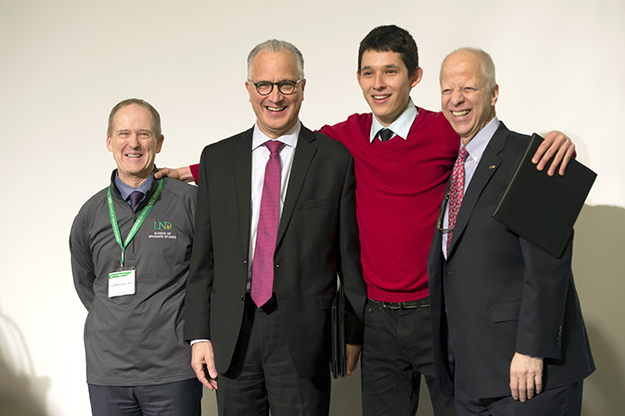 Diego Rodriguez (second from right), a master’s student in cello from Venezuela, receives his award at the first-ever UND Grad Research Achievement Day. Rodriguez is joined by Grant McGimpsey,(left) vice president for research & economic development; UND President Mark Kennedy and UND Provost Tom DiLorenzo. Photo by Jackie Lorentz. A mathematician and a cellist struck up an unlikely friendship last Thursday. “This is beautiful – all this variety and diversity – yet we are all doing the same thing,” said Diego Rodriguez, a master’s cello student from Venezuela. He was talking about GRAD – Graduate Research and Achievement Day – last Thursday, when more than 220 graduate students showcased their work for the University community, the public, judges, and other graduate students. Rodriguez’ display, a video of him playing cello, was next to a scientific poster by Hans Musgrave, a mathematics master’s student from Mountain View, Ark., who is working on a way to diagnose lung cancer earlier by using an algorithm that maps CT scans. Fostering such interactions was one of the goals of GRAD, said Grant McGimpsey, dean of the School of Graduate Studies and vice president for research about the March 2 event in the Memorial Union, which celebrated research, scholarship and creative activities. From posters to videos to demonstrations, GRAD demonstrated the depth and breadth of research and scholarly work at UND. 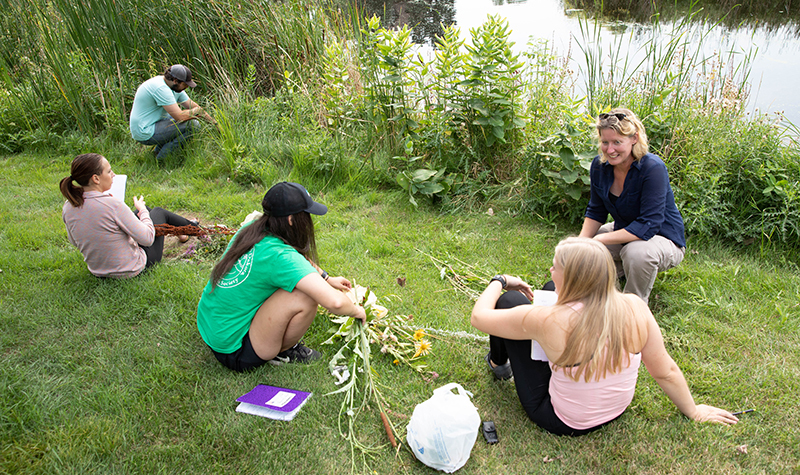 “I wanted graduate students to feel appreciated as a central part of the UND community,” McGimpsey said, adding that another goal was to assemble an audience for students so they could explain their work to non-experts. And he wanted to expose the students to other disciplines and possible collaboration. Most of all, he wanted a “wow.” And he got it. 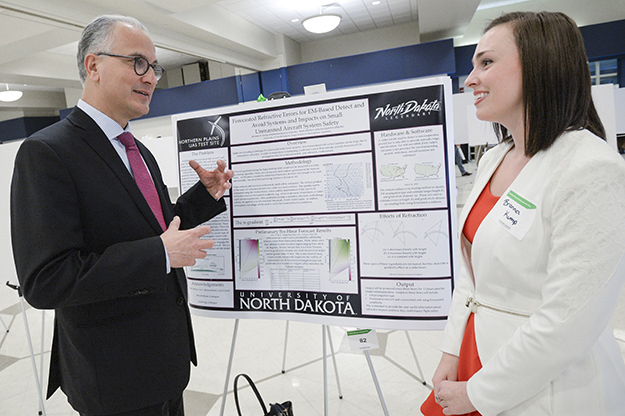 Brianne Kump, a master’s degree student in the UND Department of Atmospheric Sciences, talks with UND President Mark Kennedy about her research poster on Detect and Avoid Systems and impacts on small unmanned aircraft safety. Photo by Jackie Lorentz. Originally planned for just the Memorial Union Ballroom, the 223 entries, many more than expected, spilled into the adjoining lounge. Students were enthusiastic about sharing their work – and their passions. 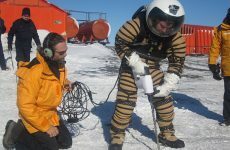 Displays and research ranged from work on Alzheimer’s disease to poetry, novels, how astronauts dream, oil generation, diesel exhaust chemical composition, blood pressure monitoring, antenna design, ice skating efficiency, land use, movement of elk, and hundreds more topics. “I’ve had such interesting conversations,” said Sarah Heitkamp, an MFA student in visual arts from Petersburg, N.D. “This is a great opportunity to show off what we are researching and studying.” Her work looked at interactions on social media and how words can be taken out of context, demonstrated by common phrases cross-stitched on fabric. “There is an incredible diversity of work,” said Joe Hendron, an aviation master’s student from Elkton, Md. “There is a lot of hard work on display.” His work focused on the safety of using cell phones and other technology in aviation. The format encouraged attendees to ask questions, something Xiao Lieu, a chemistry doctoral student, appreciated. “When people ask questions, it helps me see problems and improve my research,” she said. Her poster discussed using fluorescent sensors to detect the neurotransmitter dopamine. Anastasia Andrianova, a chemistry doctoral student from Russia, is seeking new uses for lignin, a waste product of the paper industry. “This is a great opportunity to interact and see what people do and to make new friends,” she said. “I like talking research, and it’s nice to see a bunch of researchers and disciplines come together like this,” said Staci Dreyer, a biology doctoral student from Ottertail, Minn., who is studying endectocides to treat livestock and possibly reduce malaria transmission. “I would do this again,” said Alex J. Holte, a non-degree-seeking graduate student who also works as a payroll specialist in human resources on campus. “It’s a good experience to meet people and visualize what’s going on in research.” Holte looked at personality traits and how they influenced cell phone behavior.